Kyle and I had our 4 year wedding anniversary on Friday and it’s still so hard to believe that this will be our LAST anniversary as just the two of us!! We decided to keep it pretty simple this year since I’m 9 months pregnant and the size of a small hippo. We decided on dinner and a movie, and honestly that’s all I had the energy for! “Mommy she has a BIGG tummy!!!! Look mommy! !” over and over and over. Kyle and I were DYING laughing and the poor mom was absolutely mortified. I had already walked by so I don’t think the mom knew that I was actually pregnant at first but then once she finally saw my belly she was like “It’s a baby!! It’s a baby in her belly sweetie!” hahahah Oh man, it was SO funny y’all. 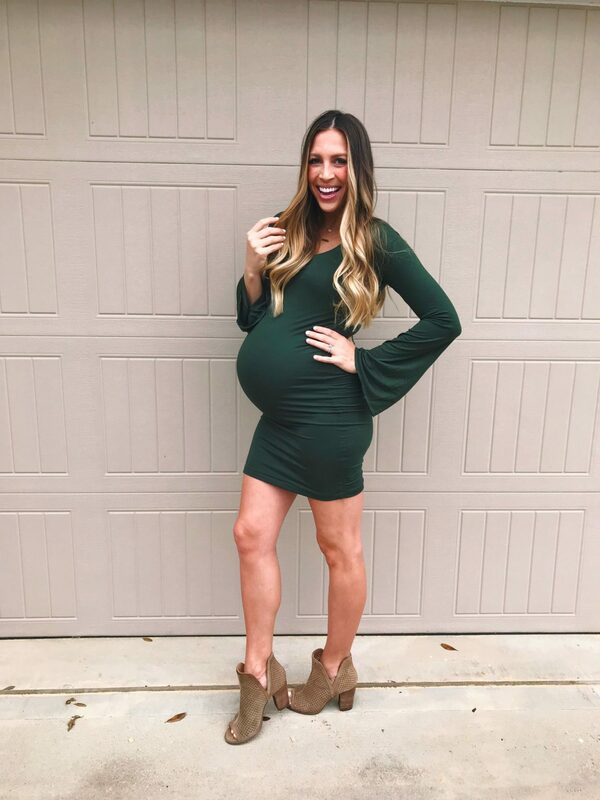 This dress is from SexyMamaMaternity and I L O V E it so much! I actually ended up throwing on some converse and a plaid shirt tied around my waist for a more casual look for the movies – because let’s face it, when you’ve got a 6 lb baby in your belly your feet NEED to be comfortable. I love how easy this dress is to accessorize and dress up or down. It’s been super nasty and rainy which makes it really difficult to get outfit pictures done for the blog, ugh. Which usually wouldn’t be a big deal but I feel like I have SO much to share with y’all while I’m still pregnant and I’m definitely running out of pregnancy time!! we ended up taking Charley to the park that morning since we knew we’d most likely be bundled up inside the rest of the day! Tomorrow I’m sharing some of my favorite places to buy maternity gowns for photo shoots so make sure you come check it out!! Yes, I’m wearing knee pads…like I said…there was no stopping me. I think it’s safe to say that our lives have officially been taken over by “preparing for baby”! Weekends are spent working on//building things for the nursery and weekdays are being spent planning out hospital bags, reading up on baby sleep books, googling all kinds of ridiculous questions, and texting all the new mamas I know asking for ALL THE ADVICE. This little boy is already taking over our world and he’s not even here yet – but I wouldn’t have it any other way! 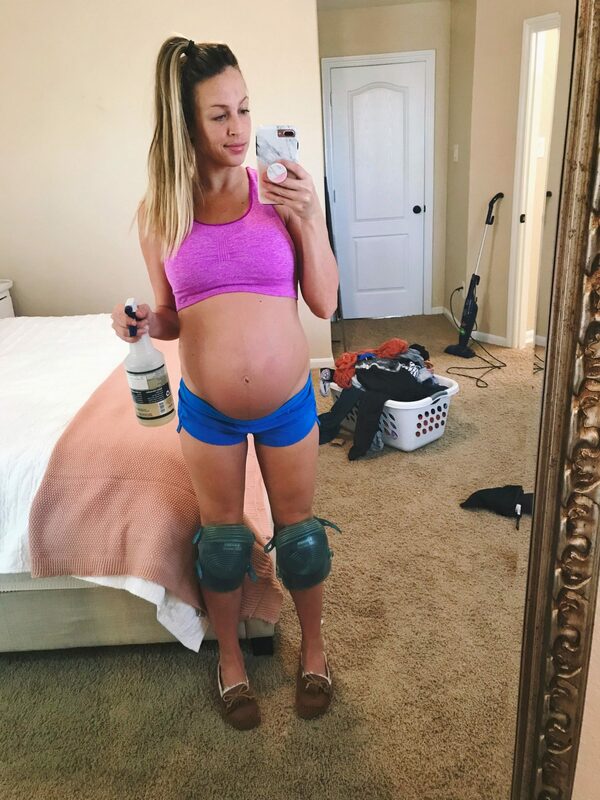 My body is definitely mad at me for all the work I did yesterday but I feel SO much better knowing that the house is nice and clean…and just a LITTLE bit more ready for Hayes’s arrival.. Which is honestly silly because I’m sure it will be a disaster again in a few days..and we’ve still got 5 weeks until baby boy shows up! Kyle built an awesome book shelf for the nursery this weekend and I am SO pumped to decorate it. He’s also building some shelves for the closet which will help a ton with keeping all of Hayes’s things nice and organized. Everything is slowly coming together and he’ll be here before we know it! Next up is my baby shower!!!!! I’m wearing this adorable little leopard dress I found for *super* cheap. Can’t wait to show y’all! That’s it for today, Happy Tuesday babes!! 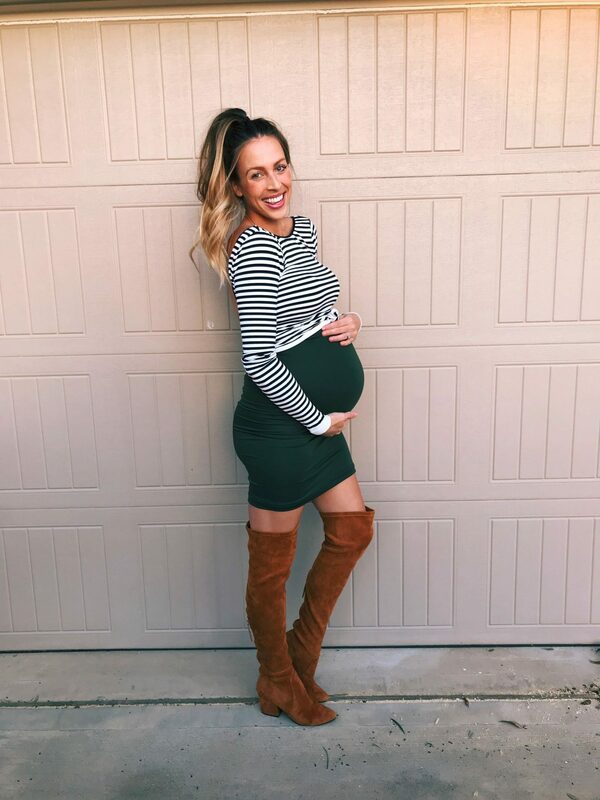 They have the cutest maternity wear ever!! 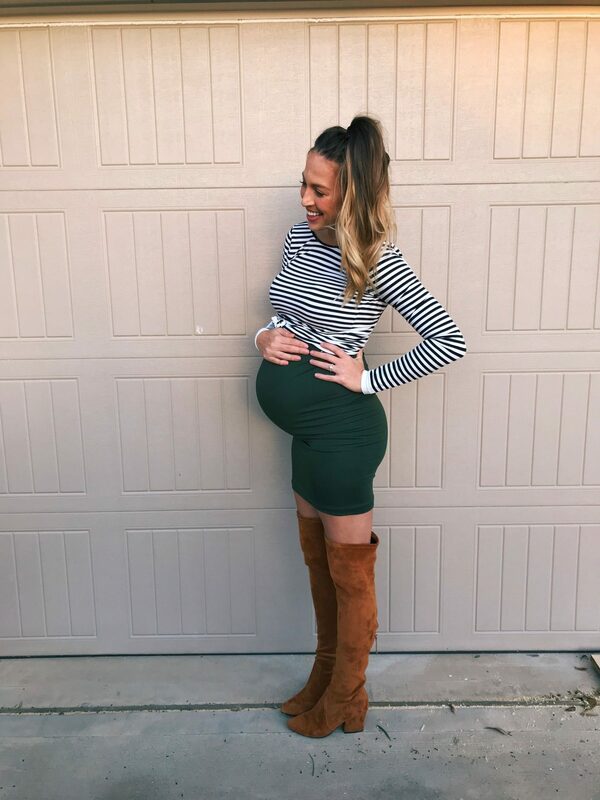 like the maternity overalls/bumperalls I shared with y’all here. 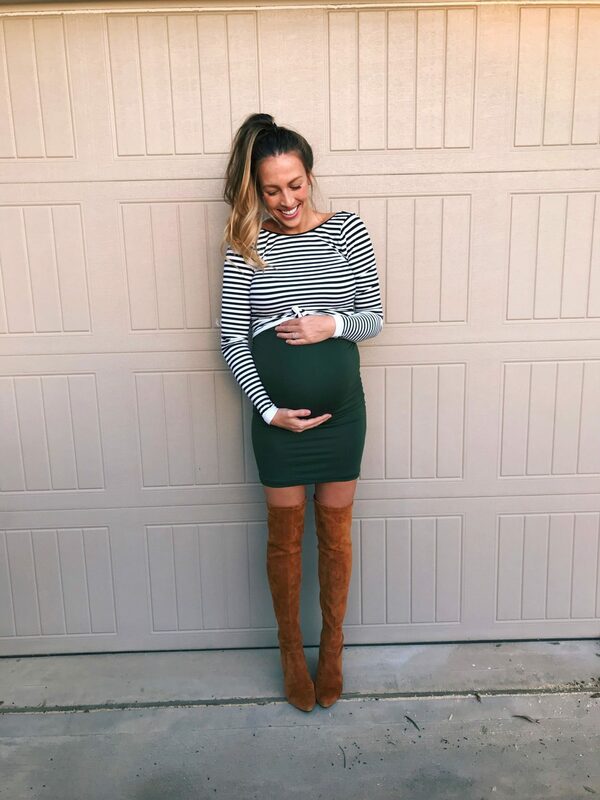 I styled this over the bump olive skirt from them and received so many compliments on this look! This year is going to be full of changes and I’m determined to make them positive ones! I’m less than 7 weeks away from becoming a mommy – our little world is going to be SO different soon. but working from home can be HARD. It’s so easy to put things off, or get distracted, or only get things done half way. 2018 is going to be a productive one, I’ve got big dreams y’all!! and make my life a little happier. Yes, I’ve made these resolutions before, but I’ve actually been sticking to them this year and it’s amazing how much better I feel and how much my stress level has gone down! I have never been a “bed maker” I’ve always thought it was so silly. Like what’s the point of making a bed for no one to see and then only to unmake it a few hours later? and I mean, what if I happen to want to get back in it sometime during the day?! All great points…BUT y’all… it really is amazing how your entire world can feel put together when the bed is made…anytime I walk into our bedroom and the bed looks pretty a sense of “yes, I got this, what can I get done next? !” immediately comes over me. Also, there’s nothing better than starting your day with an accomplishment/getting a task done. AND when unexpected guests do come over – It’s always a nice feeling to know that your house is already somewhat put together. Need I say more?! Laundry and I are not friends, we hate each other actually. I am notorious for letting laundry pile up and get out of control & then be too overwhelmed to even get started on it…OR raise your hand if you’re guilty of re-washing/drying the same load of laundry 3 times because you keep forgetting to throw it in the dryer//take it out of the dryer!! Yep. Same girl, same. WELL, we’re adding another family member soon and the laundry is only going to start getting worse and worse, so I’ve been throwing a load in every morning, putting it in the dryer when I get a chance…and then making sure I put it up before bed – no more re washing/re drying 10x in 2018. This has helped make my life SO much easier y’all…one load a day is NOTHIN’, especially when you know that’s all you have to do. 3. Set time aside to pray/get a quiet time in every morning. Life is busy and crazy and it’s so easy to wake up and just get going and distracted. I really want 2018 to be a year of spiritual growth for me, so this is a really important part of my daily schedule. I want to really focus on praying specifically for Kyle and Hayes every single morning. I’m going to link my absolute favorite devotionals for y’all below. Jesus Calling is absolutely incredible, it’s gotten me through some really rough patches and each day the devotional was always SO spot on and relevant for me that it was a little scary haha. The power of a praying wife has been so perfect in helping me pray better for Kyle – sometimes ya just don’t have the right words or know exactly how or what to pray for when it comes to your husband and this book has helped me SO much. I just recently started The power of a praying parent but i’m sure it’s going to be just as great! I am extremely ADD, I get distracted easily and I’m never able to finish a task without starting another one and then completely forgetting about the first one I started. So this year I want to be more intentional with my time. I’m not going to start a task unless I have full intentions on FINISHING it, and I won’t start another task until the first one is completed. <– This is going to be hard for me y’all. Also going to do my best to STOP wasting to much time just scrolling mindlessly through social media, gahhhhh I’m so terrible at that. Now there’s only so much I can do right now, because well, I’m still growing a human and can barely bend over BUT I can’t even explain to y’all how ready I am to get back in shape. I wasn’t working out regularly before I got pregnant and I totally regret that and MAJORLY miss being healthy and in shape. My goal is to get my Summer body that I had back in 2015, but Lord knows it’s going to take some time to get this baby weight off and gain all my muscle back…BUT I know I can do it and I’m super excited to start making small positive/healthy changes until I can really start working out again. 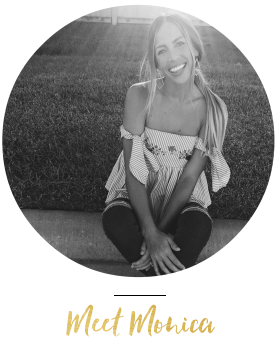 5 super simple changes I’ve been making in 2018 that are already making me so much happier and stress free! A year ago today I got real personal with y’all. A year ago today I opened up and shared that Kyle and I had been struggling to get pregnant. It was one of the scariest things I have ever done. One day something just came over me, and I knew God wanted me to share my story. I wasn’t sure why, and as I sit here typing this, with my baby boy kicking and doing flips in my tummy, I’m even more confused as to why God put it on my heart to share. I would be lying if I sat here and told y’all that there aren’t times that I regret sharing. while so many of you are still feeling the pain that I was feeling just last year. I remember writing the post and feeling so worried about what people were going to think. what I needed or wanted to hear at that point in my life. no one really knew for sure if I would be okay or if I would be a mommy one day. I was broken, sad, confused and felt alone. It’s crazy because SO many people are opening up these days and sharing their stories. However, everyones story and situation is SO different. and everyones journey is just SO unique. told me your personal stories and how you were struggling as well. and I felt like I had this small community of people who somewhat just “got it”. I continue to pray for each of you every day. I pray that my story gives you hope and not sadness or jealousy. and the wisdom to know when it’s time to just breathe, take a step back and give it all to Him. but I’m 100% aware that those desires of your heart are there and sometimes being around family and friends who seem to all be living out your dream can be daunting. 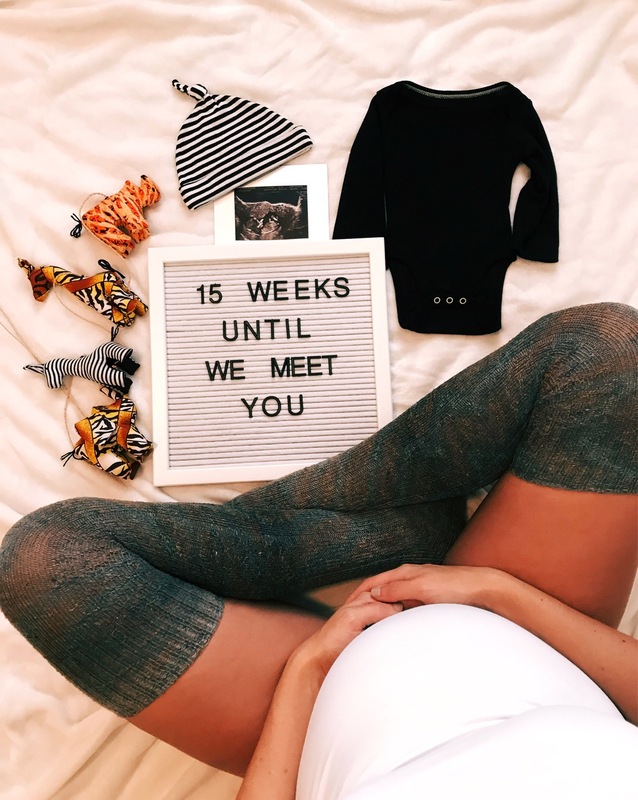 I know it’s SO difficult to put on a happy face when all you can think about is wanting to start a family of your own, and it feels like it’s happening for everyone around you. You’re being thought about today. and You’re not forgotten or alone. for those who have come to me and shared your story. Kyle and I have been trying to start a family for about two years now. I’m aware, two years may sound like nothing to some of you. But when you want something SO badly…two years feels like a lifetime. two years of watching others post baby announcements and live out your dream of starting a family. During those two years I made multiple appointments. I went to my obgyn and expressed my feelings of concern. and I was afraid and worried that it hadn’t happened for us yet. I wanted a baby NOW. I left the appointment feeling discouraged and frustrated. Fast forward to a few more months of trying and failing. but secretly hoping it would happen since we “weren’t trying” anymore. Nope that didn’t work either. I made two appointments with two different specialists and each one had to be cancelled because of something getting in the way. and figure out what’s going on with my body…. something would come up and I would have to cancel. This happened 4 times y’all, F O U R.
I finally realized that this couldn’t be a coincidence and it had to be God. Was this God’s way of telling me to just stop and be still and trust in Him? couldn’t figure out what this meant or why this kept happening. Why did I keep having to cancel these appointments that I wanted to happen SO badly. What was Gods plan? I just couldn’t make sense of any of it. About a month later I decided to attempt to make an appointment again. On June 7th I finally arrived at my appointment. The doctor was great, very friendly, and very proactive. but of course he wouldn’t know for sure until we started digging deeper. He encouraged me to start taking prenatals again. and he referred a place for Kyle to get checked out as well. I FINALLY had a plan of action, we were finally going to get some answers. I was so thrilled to have a plan and answers to look forward too! That month crept by slowly, but I was still so happy to have a plan of action. Even if we didn’t have a baby soon, We would have answers. Fast forward to about nine days before my appointment…. I fell to the ground in shock, sobbing, gasping for air, and praising Jesus. finally read a big YES+. I could not believe it, Was I dreaming? Is this real? All of those cancelled appointments made so much more sense now. and honestly probably would’ve been left with no answers and more frustration. It’s amazing how God works. His plans for our lives are FAR FAR greater than our own. that I needed it emotionally. for the baby that I had no earthly idea that was already growing inside of me. but God worked on me in SO many ways during those two years. I needed time to figure out who I was. Looking back, I really wasn’t ready for a baby. He knows our hearts and our needs SO much better than we do. Mommy and Daddy to this sweet baby BOY that God has chosen for us.